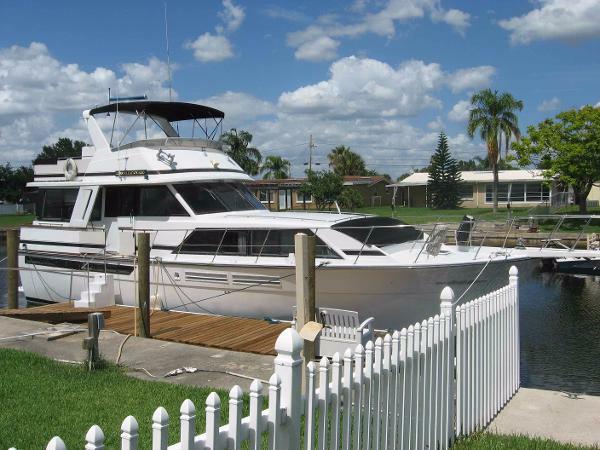 1988 Chris-Craft 500 Constellation (LOCATION: New Port Richey FL) This 50' Chris-Craft Constellation has classic features and drop-dead good looks. Walk around decks, large flybridge, comfortable aft deck, and traditional salon make her stand out in any marina. 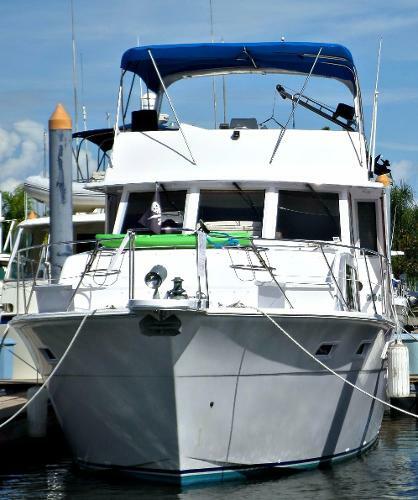 Whether you are planning a day on water or a weekend getaway, this 50' Constellation is ready to accommodate with three staterooms.On deck we start with a foredeck with stainless steel bow rail, wide side decks, and side doors to pilothouse and aft deck. The aft salon has sofa, ice maker and entertainment center. The aft deck has access to swim platform. Forward is the lower helm with Furuno radar, GPS, Robertson autopilot, Danforth compass, and VHF radio. Steps connect the lower helm with spacious bridge with radar arch and full enclosure.The main salon has large windows and warm wood tones providing a comfortable and relaxing living area. There is convertible queen sofa, dinette, and entertainment center. 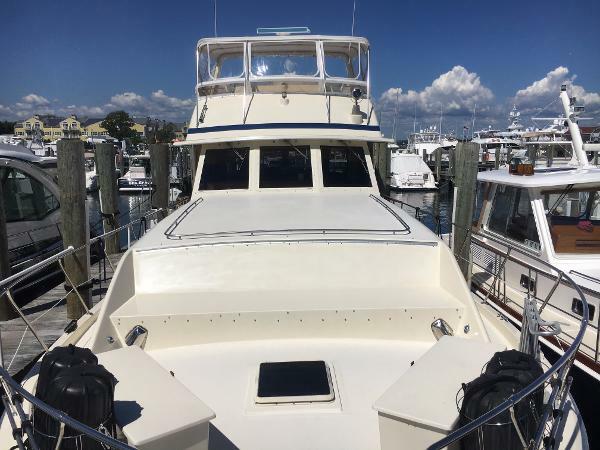 There is a full galley with wood cabinets, full size refrigerator, microwave oven, Princess 4-burner range with oven, Kenmore dishwasher, trash compactor,and stainless steel sink with Instant Hot water.There are three staterooms. The forward stateroom has upper and lower bunks, head compartment, and laundry with washer & dryer. The center stateroom/office has upper and lower berths, desk, book shelves. There is a guest / day head compartment across from the office. The master aft cabin has queen berth, dressing table, cedar-lined hanging locker and private head with vanity and tub.This Chris-Craft is powered by twin 550-hp Detroit Diesel engine. Five Marine Air reverse cycle HVAC units maintain interior comfort and an Onan 20-kW generator provides offshore electrical power. 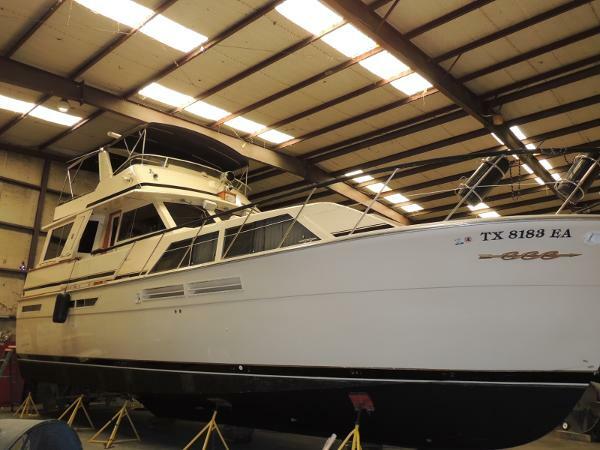 This beautiful 50' motor yacht is exceptionally well maintained and ready to cruise. This is not a restoration, she has had owners who have cared for her. Call now and make an appointment to see for yourself what classic boating is all about. 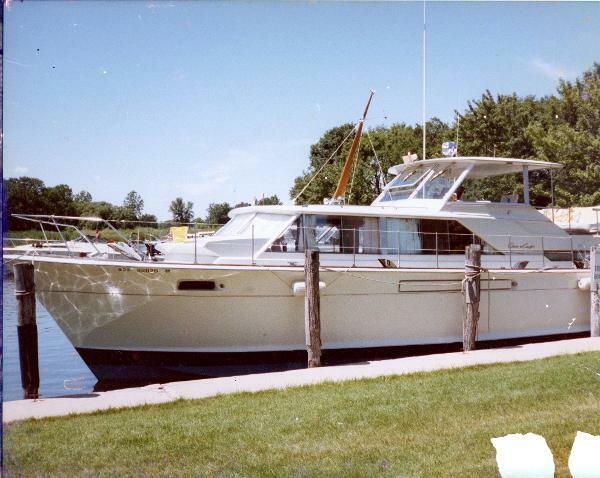 1986 Chris Craft 500 Constellation Handsome 50-footer originally built by Uniflite is basically a stretched version of the popular Pacemaker 46 Motor Yacht form the 1970s. Expansive three-stateroom interior in notable for wide-open salon, standard washer/dtyer, unusual forepeak head compartment. Fully enclosed and paneled aft deck serves as a second salon. Aft guest cabin doubles as den/office. Extended flybridge can seat a dozen guests. Note wide walkways.